You can add one reader, or specify multiple datasets to include as multiple readers. Select Readers > Add Reader. Alternatively, use Quick Add. Browse to the dataset file (or group of files) that you want to add. FME can usually determine the format from the file extension, and will automatically populate the Format field. Specify parameters and coordinate system (if applicable). Tip: If you frequently work with the same reader, you can create and reuse the same sets of parameter values. For more information, see Parameter Presets. If you drag the file directly onto the Workbench canvas, the Add Reader dialog box will appear with the format and dataset name already filled in. Workflow options determine the number of feature types that will be displayed on the canvas. Selecting either one will not affect the outcome of the workspace: these options determine only how the feature types appear on the canvas, and how they are interpreted within the workspace. By default, the Individual Feature Types option will be selected. This means that for every feature type in the dataset (assuming there is more than one), Workbench will display a corresponding feature type on the canvas. This has always been the default workflow for Workbench and for most workspaces, this option is sufficient. If, however, you want to display only one feature type on the canvas, you can select Single Merged Feature Type. 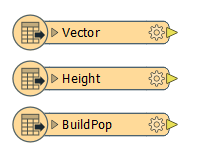 All feature types in the source dataset are merged into one single feature type. Note: If you want to separate the feature types later, you can do this through the Feature Type dialog. After you press OK, the log window will display processing information, and the feature types will appear in the reader area of your workspace. There are a few ways that you can create a workspace with multiple readers. Select multiple files when you create a new workspace. When specifying a dataset, click the Advanced Browse button . Double-click the source (reader) dataset parameter in the Navigator pane, and click the browse button to select multiple files. To add readers of differing format and schema, or readers of the same format and schema but for which other dataset settings need to be different, select Readers > Add Reader from the menu bar.